Kahawai, flounder, groper, blue cod, tarakihi – many fish are caught by recreational anglers and commercial boats close to the coast. Hundreds of other species also frequent this varied habitat, including the seahorse, the neon pink maomao of the north, and the southern telescope fish. 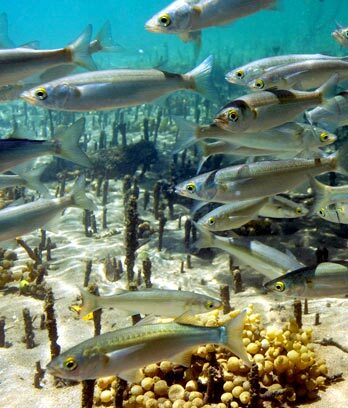 There are hundreds of fish species in the waters close to New Zealand’s coast. You may spot them in rock pools and estuaries, or from a wharf. Many live in water less than 10 metres deep. Others live further out, or hide on the sea floor. What is the coastal zone? New Zealand’s coastal waters begin at the shoreline, and stretch out over the continental shelf. This is submerged land that continues underwater in all directions for over 100 kilometres in some areas. Shallow waters. Flounder lie camouflaged in sand or mud. Spotties swim round the rocks, eating almost anything. Deeper waters. Snapper feed on squid and small fish. Fishing boats catch them, along with trevally and kahawai. Silvery anchovies and sprats dart about, and are snapped up by seabirds. Sea floor. Cruising at depth over rocks, blue cod, groper and bluenose prey on fish and squid, and pink maomao feed until dusk on plankton. On sandy floors further south, the ugly monkfish burrows down, snatching smaller fish with its large mouth. There are more species around the North Island, where the water is warmer. They include mullet, trevally, kahawai, snapper, John dory, and goatfish. Fish that prefer the cooler waters of the south include barracouta, red cod, black cod, monkfish, and telescope fish. Spotties. Children often catch these from the wharf. Spotties have sharp teeth for picking small creatures off underwater rocks. Triplefins. These little fish have three fins on their back, and live on the sea floor. Blue cod. Mostly living south of Cook Strait, blue cod are sold at supermarkets and fish shops. They are inquisitive fish who may nibble at divers’ fingertips. The male seahorse keeps the eggs of its young in a special pouch until they hatch. Demoiselles, found around northern reefs, are like swallows, flitting about with a forked tail. The leatherjacket looks like a rugby ball, and some have spots they can make disappear.